I attended a masterclass given by Pinchas Zukerman a few years back, and it was INTENSE. It actually verged on psychotherapy during the question/answer phase, with Mr. Zukerman calling into question one person’s motivations for being a musician! But the thing that made the biggest impression on me was one particular violinist who played part of the Tchaikovsky violin concerto. After she was done, Zukerman immediately started focusing on her shoulder rest, telling her she didn’t need it. He made it funny and teased her a little, but then he challenged her to get rid of the shoulder rest, that it hindered her playing….then he threw her shoulder rest out into the audience. I played in a pit orchestra with this violinist, and watched her struggling to adapt to playing without the shoulder rest. I have since lost touch with this violinist…but I have a prediction: She has either quit playing professionally, or she has gone back to her shoulder rest. If I am wrong, Baggs, I will pay you $50! What do you think? To rest or not to rest? Years ago I decided to emulate the great violinists of the first half of the twentieth century, the likes of Milstein, Oistrakh, Heifetz, Kogan, Menuhin, Szigeti, Francescatti, Sheryng, et.al., and dispense with the training wheels (shoulder rest). I have a rather long neck and I am quite slender. The transition was excruciatingly difficult and frustrating. It seemed to utterly defy the laws of physics and border on the impossible–except that the great masters of the violin played that way. If they all could do it, so could I. I persevered. In teaching a child to ride a bicycle one runs long side holding the bike up, seemingly forever, until that magic moment when the child’s balance and coordination kick in and off he goes. Just so with banishing the shoulder rest. For me playing without a shoulder rest is much more natural and liberating. I could never go back. Wow, thanks for sharing that. I’m glad that you “arrived” at a happy place for your violin playing! 1) Hilary Hahn uses a shoulder rest. I think she is far from a weakling! 2) As mentioned, music is different now. A couple hundred years ago people didn’t shift as much or use vibrato as much. Even one of my professional friends who plays without a rest said they had one very tricky piece once where they used a rest b/c it was simply easier. (They still normally play w/out though.) Watch a group like Tafelmusik, youtube. The play baroque with period instruments – no chin rest! Very fluid, but then again they are not playing a Mendelssohn concerto! I wanted to correct/clarify some statements about playing w/out a shoulder rest. I read/watch a lot of articles here and have found them helpful. Maybe my comments will be helpful to someone else. First, I don’t care whether people use a shoulder rest or not. I like the way Hilary Hahn sounds (with); I like the way Anne-Sophie Mutter sounds (without). I started playing with a shoulder rest and liked it. I stopped using one about 2 mo ago. With the shoulder rest, when I started playing in higher positions (5th+) , my arm didn’t have as much room as I wanted. I adjusted the violin and changed chin rest and then my shoulder hurt and I was very tense. I tried adjusting all sorts of things and ended up ditching the shoulder rest. It took me many weeks, lots of googling, and the help of two professional players, who have played with and without, to sort it out. I now play with a centered chin rest and just a small pad (for a shoe) on the metal part of the chin rest on the bottom of the violin. Otherwise, the metal hurts my collar bone. Here is what I learned. First, without a shoulder rest, there seem to be two ways to hold the violin. One balances the instrument b/n the collar bone and left hand. (I do this. For me, there is a “right spot” on my collar bone such that this is all very stable.) The other puts the instrument somewhat on the shoulder (Mutter seems to do this.) I find that I hold the violin fairly flat and with the scroll more forward, as compared to people who play with a shoulder rest. Look at Hilary Hahn versus Anne-Sophie Mutter. Draw a straight line down their fingerboards to through their neck, and you’ll see what I mean. The angle is different. Balanced only on the collar bone and hand, there is very little contact with the back of the violin, contrary to what one reader wrote. I like this because my arm is freer than with a shoulder rest, and I can move the violin more. This might be a con for some people. So, shifting and vibrato. This was a disaster at first. As a reader said, going from first to third isn’t so bad but anything else is – at first. I have a student violin and the neck was not very smooth. My teacher had a luthier correct that – it’s super smooth now. After that, it was a lot of practice – weeks – and input from my teacher. You simply cannot hold with the left hand the same way you can when you have a rest. The left hand supports, but has to slide. The violin also moves some, or rather I’m learning to move with it so that the shift is smooth. I’m about 2 mo playing without and I’ve improved a ton. I’m still shoring up the shifting to 5th+, but I no longer feel like “I can’t shift!” I’ve seen people play well this way so I know it is possible! As for vibrato, I was in the process of learning it when I switched over. I had a slow vibrato. Dropping the rest set me back a good bit. With a shoulder rest, your left hand can have no weight on it and that made vibrato (relatively here!) easy. Now I have weight in the left hand. First I couldn’t do vibrato ,and when I got a bit of it the violin wiggled. I talked to people and watched videos. For me, I had to bring my left hand around, towards the E, as compared to with-the-rest. Again, Hahn vs Mutter: Hahn can do vibrato with her thumb almost sticking above the finger board. Mutter has her thumb more under the neck. I could be wrong, but I don’t think you can do vibrato like Hahn if you don’t have a shoulder rest. So, I had to reposition my hold a bit. I also have to be very loose with my hand and let my finger roll so as not to pull my thumb along which then causes the violin to jiggle. It’s a lot of practice again. But, I finally go my slow vibrato back, and since then I’ve progressed and sped it up a bit. So, playing without a rest? I think it’s just different. It was frustrating at first, but I like it now. From my experience, you have to literally hold the violin differently, the angle, the left hand. It seems impossible to play if you just remove the shoulder rest and try to play like you did before – it may be impossible. This was *not* clear to me at first, hence frustration. I think this also causes confusion, e.g. some of read Doug’s statements. I also think that with so many people playing with shoulder rests, it’s hard to see examples of playing without, e.g. on youtube. So it’s hard to know what to do. If you want to try playing without a rest. 1) If at all possible, find an experience player who know how to do this. 2) Be patient. Finally, as I said, physically I can balance the violin on part of my collar bone and my left hand. I had to do some trial and error, but there is a nice spot that is comfortable (with a pad for the metal part of the chin rest, on the bottom). If your collar bone is somehow different, this might be a problem. Elizabeth, thank you so much for taking the time to write up that long, but informative post about playing without the shoulder rest! I really appreciate your input. I do agree that for some people, it is very natural to play without a shoulder rest, so I try to keep that option open for my students, but I really am at a loss to help them learn to do it. Your descriptions are very helpful! The masterclasses of Yehudi Menuhin on YouTube are a great resource for students attempting to learn this. Hope to hear more from you, Elizabeth. Lora – I meant to add that as others also noted, the chin-rest is also an important part of the equation (with or without the shoulder rest). My “no-shoulder-rest” approach depends greatly on the particular chin-rest I use (which also took many years to suss out). Thank you – I am pretty sure I’m in the minority. I’m always excited to meet someone who doesn’t use a shoulder rest. Do tell! What chin rest do you use? We’d love to know. I love input from non-shoulder-rest users, because I really REALLY cannot play without a shoulder rest….and I know it requires certain concessions from the left hand. I never FORCE my students to use a shoulder rest, but if they go rest-less…..then I can only do so much to help them, especially with left hand issues. I had a couple of really young students (both male) who, in Suzuki Book 4, decided they hated their shoulder rests….and so I watched as their little child-brains figured out how to do without….and they did figure it out….but I also think it has to do with having a body-type that is conducive to going rest-less. I hate shoulder rests. I tried every type made, for years, and was never happy. They dug into my chest, or hurt my shoulder, or the angle was wrong. The only shoulder device that came close to working was the Playonair blow-up. The main thing though – and this is very important – the sound coming from my fiddle as it was suspended above my shoulder – connected to nothing – was hollow and disconnected; suspended, if you will. I love the feeling of the fiddle touching my body; and the sound, as it vibrates from my shoulder, is a grounded, connected sound. Occasionally I feel the music vibrating in my collar bone and I love it. It took years, but I finally settled on a small folded square of rubber shelf lining that I attach with a rubber band. It offers no height, just an anti-slip surface. Bottom line = my fiddle and I are one and connected. My father was a violinist, born in 1904. He never had a shoulder rest and if it was good enough for him, it’s good enough for me. So interesting to hear from a “No-Shoulder-Rest-Enthusiast”! I love how you describe the connection between your body and the instrument, and the vibes etc. That is definitely a plus! I often wonder if there is a practicing professional person somewhere who uses equipment to identify the correct type of rests (ie both shoulder and chin rests) for the individual violinist. Opticians for instance use variably ajustable spectacle frames that can be ajusted to fit any shape of face when a patient eyesight is being tested together with various lenses to ascertain the correct spectacles for each individual before prescribing takes place. In the same way a professional shoulder/chin rest specialist could after testing/measuring advise/recomend the best combinationof rests for the violinist.! If such an individual exists, please advise, oh! I live in the UK. What a GREAT idea! If someone could turn it into a science, I want to invest in stock with them….because they will make big bucks. Julie Lyonn-Liebermann is a wonderful jazz and other violinist and teacher, and she has done a pretty good study about violin and viola “ergonomics” and has a DVD presenting her findings….I think it is called, “Violin and Viola Ergonomics”. And the BIGGEST thing that causes alot of consternation is that the CHIN REST must cooperate with the SHOULDER REST! If one is off, the other will feel off, even if it is the right one for you!!! I’m not sure which one a person should start with……some say the chin rest…..but if I had to choose, I would say start with the shoulder rest, and ignore the pains in your jaw, or pad your jaw temporarily while you experiment. Get the shoulder rest to a happy place, and then the chin rest is like fine-tuning, no major changes. I LOVE this process…..if you need help, let me know. I’ll offer what I can. I borrowed Julie’s DVD from a friend, and I’m just waiting until I have time to watch it. I’ll share any world-altering things I learn! Ran into this page by accident, and found it interesting! Lets clear up a few mistaken notions. A shoulder rest does not deaden the back plate. It never touches the plate unless it’s badly out of adjustment. It only touches the plate at the clamp feet, which are placed near the back/rib junction, which is already a nodal point. A lack of a shoulder rest however, causes up to 20% of the plate to rest on the shoulder/chest, causing far more muffling. Without a shoulder rest, the head is NOT more free to move or look around. Put a violin between your chin and collarbone. Then place your hands at your sides, keeping the violin parallel to the floor….or can you? Many pros who don’t use a shoulder rest can’t…but we’ll assume you can. Now, lift your head up and look around. What happens to the violin? Yep, you get a bag and pick the pieces up off the floor. But lets be more fair, lets put your left hand up to support the violin. Now you can lift you head off the chinrest and look around. Okay, with your head up off the chinrest, do some quick shifts on notes from 1st. to 3rd. There is a 90% chance that during at least one shift, you’ll pull the violin off your collarbone. Using a shoulder rest, I’m able to do all these things very easily. It spits in the face of logic to say you are more free without a shoulder rest and I’m tired of hearing it. I totally agree. Even the pros like Menuhin (oddly, there is a Menuhin model shoulder rest, although he never used one! ), and the jazzer Grappelli when watched in videos are constantly tucking the violin back under their chins. I suspect that if they had started using the rests, they would have played even better in later life. Okay, my rant is over! Thanks for piping up, Doug! You can say those things on this site…..but man, don’t say it on Violinist.com! I tried advocating for shoulder rests on that site and I got jumped by a bunch of anti-resters….and it wasn’t pretty. I had NO IDEA people were so defensive about the use or non-use of shoulder rests until I got bloodied by the non-resters. I would never try to force someone to USE a shoulder rest if it didn’t help them. I actually did have one student who hated his shoulder rest from day one. (he was only 10) and by the time he was 12, he had stopped using one altogether….and yes, his violin would float parallel to the floor. So it can happen. And of COURSE I didn’t try to force him to use a rest. But, most others are exactly as you describe, Doug….it’s a whack-a-mole game between left hand, head/chin, and shoulder, the 3 points of contact. A shoulder rest eliminates one point of contact (left hand) and greatly minimizes another (head/chin). Thanks for chiming in. See you around! Thanks again Lora, I’ve had a fiddle with it (no pun intended), and adjusted as much as I can. It seems I have short neck syndrome and have to do a lot of stretching to get the violin in place, but it is sitting better now. I’ll find something to attach to the front to further prevent slipping. I’ve heard of people using car wash sponges instead of a shoulder rest. I might try that one too. Of course it’s personal preference. I am having some shoulder rest issues. Mine seems to slide forward a lot. I know my posture is correct because I use a mirror, maybe I just have droopy shoulders? If I hold the violin higher, I can’t get my hand far enough to use the tip of the bow. Having said that, if there’s going to be a slap, can you video that, because I’m too far away to come watch. As far as your struggle to go to the TIP of the bow: It’s not always necessary to go to the tip on every bow….if your arm length is making this difficult, then consider 4 inches from the tip your tip. Also, when I need to get the VERY TIP, my pinky comes off the bow, and my bow hand pronates pinky up and thumb down….this usually gives my arm the extra length it needs without strain. The quick fixes for your problem are that you can put something on your shoulder rest that will cling to your clothing on top of your shoulder. Hair ties made from terri cloth work well, if you put it around the shoulder rest, and double it up to make it snug…or put several on. I’ve seen people use “scrunchy ties” (ask any girlie-girl what these are….she’ll tell you) I personally glued “cork” onto the wood of my Mach1. Anything to prevent “slippage”. Try to figure out where the slippage occurs, and put the scrunchy tie there. Also, adjust the portion nearest the G String SHORTER, and adjust the portion toward the E string TALLER. Most shoulder rests have a longer screw for the E string foot than the G string foot. Finally, play with the “swivel” function of your shoulder rest. If you have it swiveled the wrong way, it won’t cradle and cling to your shoulder. How is your chin rest? Sometimes chin rests create shoulder rest problems. It should cup your jaw, and your violin should be snugged up to your neck. I don’t have experience in this area but I do have experience in going online. This seems to be a debate that pops up all the time and the debaters can be quite aggressive. 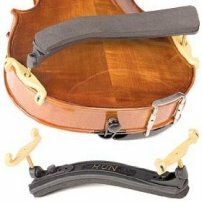 As a beginner my opinion is that the shoulder rest allows stability and repetitive stability (not having to adjust it). I feel that if one were to play without a shoulder rest, they need to be a lot more conscious with their body since now the violin can seemingly be placed in more different ways than with a shoulder rest. Meh, you could if you want to, but I think that would entitle me to a free live lesson, so take your pick. Like you it’s said personal preference. I hate it when people start shouting “This must be done this way or else!” especially with relation to music. To me the most important thing is how it sounds, if your comfortable with your way and it sounds good enough then go with it. I play classical guitar and the same sort of thing comes up in relation to whether it is better to put the guitar on the left leg or the right. You are absolutely right, Kheenan…there are no absolutes–to each his own….and if I slap you, then you can have a live lesson…but it will be a VERY long drive! Them’s fightin’ words! It’s a good thing you wrote “j/k” after that statement, because I was about to jump down your throat!!! Yes, it’s a personal preference….but it’s not just a crutch for those of us who have the anatomy which requires a shoulder rest! I have had one student who naturally eliminated his shoulder rest (he was 10 years old)….and it baffled me, but I could see that his posture and form was perfect, so I left it alone. I think those who don’t need shoulder rests realize it, like you did. In response to your reference to the 16th and 17th century having never used shoulder rests, violin playing has changed SO MUCH since then, it’s not even the same ball of wax! They had flat necks, lower tension instruments, held the violin to their chests, and used vibrato sparingly.